Last week we added some structure to our growth and development as a trader, exploring how we could use our review process to drive our progress along the development pathway. (1) Find where you currently reside on the above pathway. (2) Determine the Win%, Loss%, Average Win and Average Loss stats for your most recent trades (20 trade group… minimum). (3) Identify the next level you hope to achieve. (4) Determine how your step (2) stats will need to change in order to place you within the next level of the pathway. (5) Immerse yourself into a review of the trades making up your most recent sample, to identify the reasons for failing to achieve the required statistical outcome, and the changes necessary to take you to that next level. 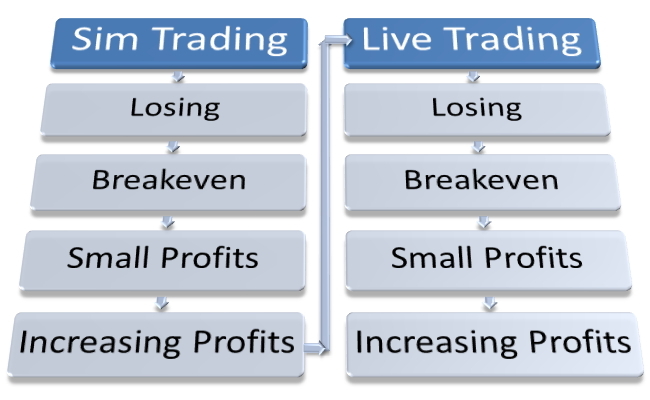 (6) Implement the changes and apply them as you trade your next group of trades (20 trade group… minimum). Let's work through a couple of hypothetical examples, in order to make the process clearer. (1) Find where you currently reside on the pathway. You already know this. You're stuck at the very first stage. Sim trading with spot forex mini-lots… and still losing. Not losing badly mind you. But just slowly grinding your way to a smaller and smaller account. No problems. That's absolutely fine. We all start there and build our way higher. First things first though, you recognise that you need to quantify the problem and get some useable stats. So you document your plan as best you can and complete a sample of 20 trades. (2) Determine the Win%, Loss%, Average Win and Average Loss stats for your most recent trades. Let's examine the stats a little closer though. You're losing almost five dollars per trade! Ok this is not the end of the world. This is something you can work with. Clearly the Win% of 55 is not to bad at all. You're winning on more than half your trades. 11 out of 20 might be only just above the 50% level, but it's still a quite typical and reasonable result. The problem is obvious though… when you do win it's typically only half the size of the average loss. The average winner is gaining just under 11 pips. The average loser is a whopping 24 pips. This is what needs to change. The Win% is fine. But you need to work on getting the average winner slightly higher and/or the average loser to reduce in size. If you can get them at about the same level (1:1) for the next group of trades, while still maintaining your current Win%, you'll achieve a breakeven sample. Or maybe even a slight profit! Looking into the stats and trades in more detail, you confirm that the negative outcome is not the result of one or two bad outlier trades. There is no occurrence of a trade held way beyond it's stop, skewing the stats to the negative side of breakeven. In fact there are none larger than your maximum 1R loss of -30 pips, with a few of the losses actually scratched for less. Loss management has been handled well. The winners on the other hand… the largest one is only 20 pips, with quite a few less than this. Here you need to delve within the trades from your sample to find out what was going wrong. Check the quality of your setups. Were you actually trading in areas where there was potential for a multiple R winner? If not… look deeper again. Is the problem with your assessment of the trend and S/R structure of the market? Or is it in assessing the bias (projecting the current price swings forward)? Or in identifying valid trade locations within that forward projection? If you are trading in areas with sufficient price movement for multiple-R profits, then this is a great sign. There is potential here. Check the quality of your entries. Are you seeking too much confirmation, entering too late in the price move? Check the quality of your trade management. Are you setting stops too tight? Are you trailing too tight? Or are you too aggressive in your profit taking and not allowing the move to play out to its full potential? Yes, this is just a whole lot of questions. But questions are the only way to find an answer. 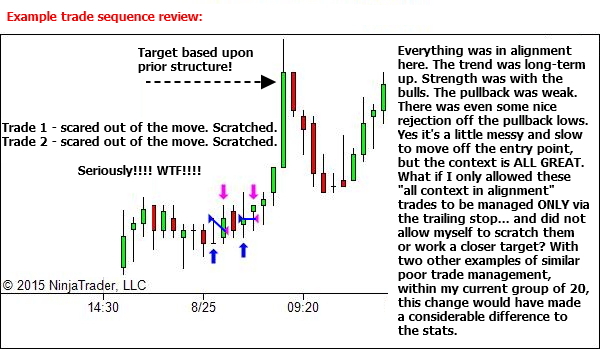 Let's say for the sake of the example that your review shows that trades were mostly in good locations with multiple-R follow-through potential. But on four occasions, when all trend and strength/weakness analysis were aligned nicely for multiple-R profits, you were scared out of the trade by the lower timeframe movement. This left you sitting on the sidelines while price moved on to your target without you. Now you've got something to work with. 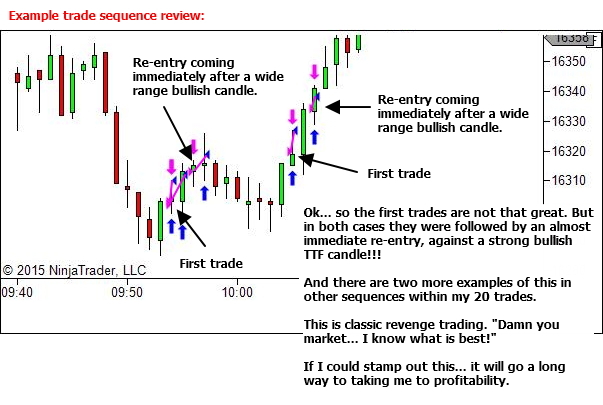 Replay these sequences to examine the thoughts and feelings at the time of trade exit. There is a lot to learn if you're willing to examine this fear. And set in place a rule that when the trend and strength/weakness analysis are all in alignment and show good profit potential, then the ONLY trade management decisions you will make are in moving the stop behind key TTF price structure. You are not to move the target closer or scratch the position, no matter what the LTF chart shows. Let the trade stop you out if it must, but don't cap the profits under any circumstances. With this group of trades, such a rule may have made all the difference, leading not only to a breakeven result but in fact well beyond that. Will it provide similar improvement for future trade groupings? That's yet to be seen. But it's an improvement that has good potential to take us to the next step. Document your procedural adjustment and set it as a process goal for the next group. 20 more trades… with the new trade management practice in place… GO! For this example, you're a futures trader aiming to take profits from the morning session of the emini Dow. Still small size, two contracts at most. Trading live… but stuck at breakeven. You know the strategy has an edge. You just need to work that edge properly! The most recent group of 20 trades offered a frustrating series of trades… some nice winners but ultimately ending up around breakeven. You're at the breakeven stage… and stuck! Slight positive pre-commissions. Slight loss post-commission. I like this step… it's the easy one. The next stage you're aiming for is just to get a small profit out of the sample. Just 1 or 2R after commissions. If you can get that consistently for a few 20 trade groupings, it will provide a massive boost to your confidence and a good launching point from which you can target increasing position size and greater profits. The win/loss size ratio is awesome. You're cutting losses well. And holding runners. This is clearly the problem. But it doesn't need massive improvement. With that win/loss size ratio, a Win% of just 30% will be enough to provide a slight profit, after taking out commissions. But let's target something higher, 45% or more, while accepting that it's ok if this slightly erodes the win/loss size ratio. How do you improve the Win%? Again, review your trades and ask a lot of questions. Is the problem with the quality of your analysis (S/R structure, trend analysis, future projection)? This would show as too many trades having no follow through potential. Is the problem with your initial stop being too tight? This would show as a number of trades stopping out before moving on to the targets without you. Is the problem with your active trade management? Have you been too impatient, scratching the trades before they have time to move? It may be obvious. If so, implement the required change. It may not be clear at all. If so, perhaps you need to just move on to the next grouping, to increase the sample size. But let's say for example that you find four occurrences of double stop outs, all of which show the second entry to be quite a poor decision as they fade strength. What if you had avoided these four re-entry attempts? If two or three of these had been replaced by better quality trades, that could be enough to improve the edge and allow a slight profit after taking out commissions. Look at how you make entry decisions. Implement some kind of procedural check after an initial stop, to ensure you're not fading new strength. 20 more trades… with the new rule in place… GO! Ok… 20 trades is not many. It's a small sample. Increase the size if you wish. I'm just saying that it is the absolute smallest sample size you should be examining, before making any tweaks to your trading plan. And of course, there is no guarantee that the problem you identified in one small sample of trades, is sufficient to improve your long-term profitability. It may well be indicative of that sample only. You'll get to know whether or not this is likely, the more you follow the process and become familiar with your trading performance. But initially… it's better than random adjustment based upon emotional over-reaction to poor trading results! Treat your business as a series of trades. One step at a time along the pathway.